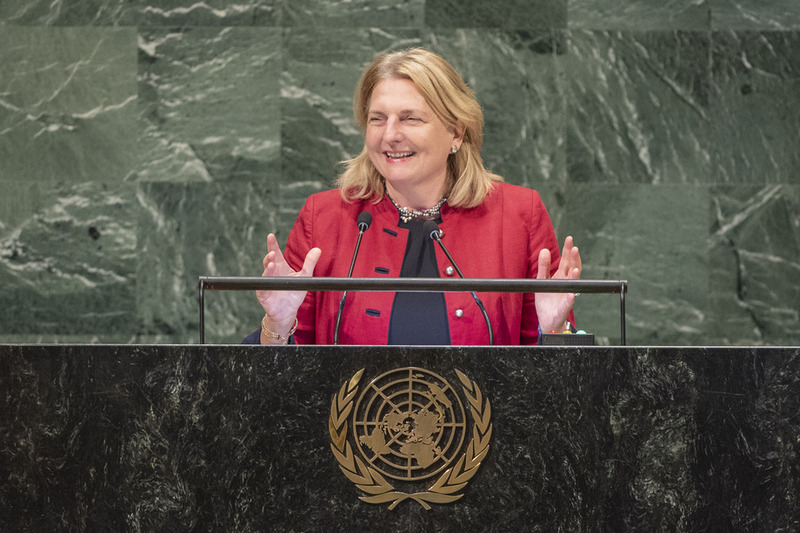 KARIN KNEISSL, Federal Minister for Europe, Integration and Foreign Affairs of Austria, speaking in Arabic, French, Spanish and English, described multilateralism as a sophisticated form of diplomacy. She warned against favouring fine statements over action, losing contact with reality and losing the meaning of an exchange of views. All too often, multilateralism fades into a flurry of meetings that some rich diplomats turn into a comfortable game, with hackneyed arguments about conflict zones where people are just trying to survive. That is why Austria, with other countries, will contribute to mine clearance in Syria and increase its humanitarian commitment to Yemen. Condemning the use of chemical weapons in Syria and elsewhere, and rejecting biological weapons, she said there is no reason not to categorially ban the production and use of chemical weapons. Noting the fiftieth anniversary of the Treaty on the Non‑Proliferation of Nuclear Weapons (NPT), which has suffered from inadequate implementation, she said disarmament treaties are not a moral matter, but a legal issue. Genuine progress must be made on the path to nuclear disarmament, with ratification of the Comprehensive Nuclear‑Test‑Ban Treaty being of paramount importance. Describing her country as a steadfast supporter of the International Criminal Court, she welcomed the extension of the crime of aggression to its jurisdiction but regretted that its work is undermined by non‑surrender agreements. Noting that the Joint Comprehensive Plan of Action was negotiated in Vienna, she said its preservation is a matter of respecting international agreements and, in the end, a matter of international security. Mutual trust is weakened if one of its parties walks away from it unilaterally. Emphasizing Austria’s focus on the women, peace and security agenda, the political and economic empowerment of women and the fight against gender‑based violence, she said multilateralism has failed millions of women around the world. The international community must stand up against female genital mutilation. Turning to the Middle East, she said the collapse of the Ottoman Empire created a new map of the region based on pipelines, with recent wars fought in the name of oil. Syria is the victim of instability created by those wars, she said, emphasizing that it is time for courageous steps towards a diplomatic solution. In that regard, she encouraged decision‑makers from Washington to Moscow, via Tehran, Jerusalem, Ankara and Damascus, to seize the momentum, for which there is no alternative.